Network disconnects can generally be diagnosed with tools like ping, tracert, and pathping, but connections that frequently and randomly disconnect can be difficult to diagnose. Often you may suspect an ISP issue, or a router to modem link, but when you contact your ISP the reply always seems to be; “it’s working now”. To be fair to the ISP, it usually is working now. You would be far more likely to get assistance if you could provide a log showing which network segment was down, for how long, and how frequently. 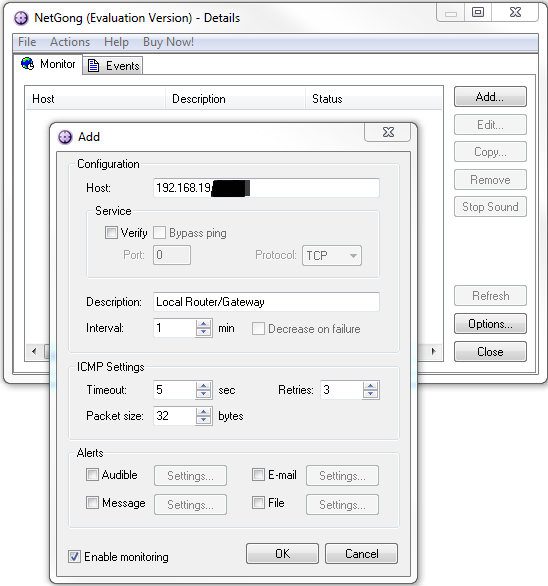 Netgong, formerly IPMonitor, is a simple little tool that can be helpful in documenting disconnects. 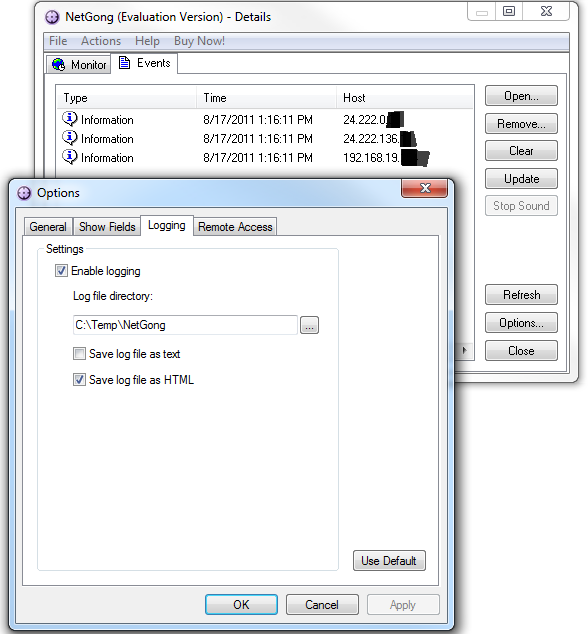 It is really nothing more than a fancy ping tool with logging, but that log can be very useful when diagnosing connections from a PC to the Internet, Virtual Private Networks, or within a LAN through various routers. Basically any connection involving multiple network segments. 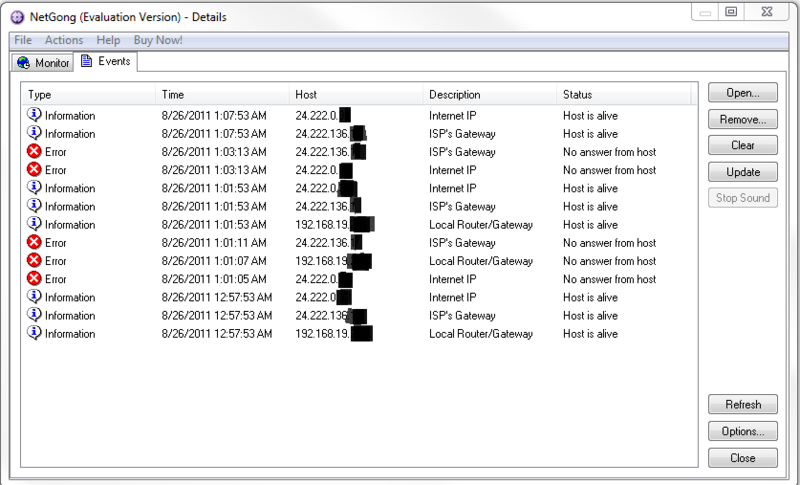 Netgong can be set up to ping multiple IPs at set time intervals of one minute or greater. Ideally you want to monitor different devices in different network segments between the client and host such as a LAN based IP like a router, an interim point like the ISP’s gateway (find from your routers status page), and an IP somewhere “in the cloud”. It does not log every ping but rather only when the connection state changes which maintains a reasonable log file size. You can see the current state in the console, or view the recorded log file in text or Html format. The next image is a sample Html log file. 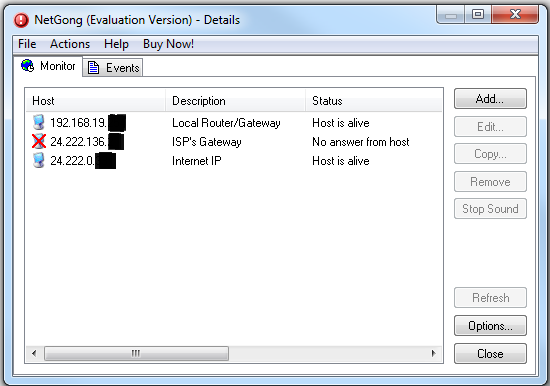 Item #1 indicates the ISP’s gateway (modem) and Internet were unavailable but the router could be pinged, showing the connection was lost between the local router and the ISP’s modem. Item #2 shows all 3 IP’s unavailable indicating a loss of connectivity between the client and local router.